Struggling for independence as an artist in a society that saw musicians as palace servants, while personally fighting to assert himself against a domineering father, Mozart’s prolific works reflect these frustrations and highest hopes. A master of all musical forms and genres, from the piano sonata and string quartet to the concerto, symphony and opera, his more than eight hundred compositions are among humanity’s most cherished possessions. 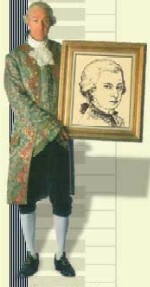 In a life cut tragically short, Mozart’s works have long endured to delight and move audiences the world over.